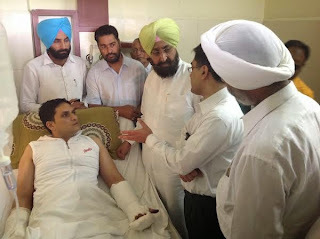 Amritsar: The Punjab Pradesh Congress Committee President, Mr. Partap Singh Bajwa, has demanded judicial probe by a sitting judge of the Punjab and Haryana High Court to inquire into the murderous assault on the Amritsar lawyer, Mr. Vineet Mahajan and framing of his friend, Mr. Sandeep Gorsi, in attempt to murder case, both of whom had lodged a complaint of “dual voting” against the Local Bodies Minister, Mr. Anil Joshi and several members of his family. Mr. Bajwa today met Mr. Mahajan and his family members in the hospital to inquire about his health and assured him that the Congress would continue its agitation in one form or the other till action was taken against Mr. Joshi for his culpability in this attack. He also demanded immediate dismissal of Mr. Joshi from the cabinet. He said it was appalling that such a person continued to be member of the Parkash Singh Badal cabinet. He lambasted the senior Bharatiya Janata Party leader and the party candidate from Amritsar, Mr. Arun Jaitley, who did not feel it necessary to meet these two victims who were also members of his legal fraternity.In a letter to the Hon’ble Chief Justice of the Punjab and Haryana High Court, Mr. Bajwa, while calling for time bound judicial investigation, rejected probe by the special investigation team as he had no faith in the Punjab police. “All investigations conducted by the police or its constituted SIT are a charade to shield and cover up for their political masters”, he added. He pointed out both these lawyers had sought to use the due process of law to bring to light the grave miscarriage of justice that related to dual voting resorted to by Mr. Joshi and his family members. Bajwa said that what was all the more outrageous was that one of these two lawyers who had dragged Mr. Joshi to the court was framed in a attempt to murder charge by the state police and the other was assaulted and seriously injured by the henchmen of the minister. “That both victims are affiliated with the Congress Party is clearly no coincidence and the vicious attack on Mr. Mahajan today rings loud with echoes of reign of terror Mussolini’s Black Shirts unleashed in fascist Italy. This is vendetta politics of the worst sort, looking to silence and intimidate anyone who gathered the courage to speak out”, he added. He said Mr. Rakesh Bhardwaj, the complainant against Mr. Gorsi, was a confidante of Mr. Joshi. There was no rule of law in Punjab and the people were subject to mercy of the police dictated by the political masters. Others who were present included Mr. Sukhjinder Raj Laly Majithia, Mr. Harminder Singh Gill, Mr. Gurjeet Singh Aujla, Mr. Inderpal singh Dhanna, Mr. Gurvinder Singh Mamanke, Mr. Joginder Lal Dhingra, Swaraj Dhillon, Kuldeep Singh Dhaliwal and Mr. Baldish Toor.